(ii) lays asphalt on floors, walls, roofs, etc., or to form damp course of buildings, where required to keep out damp, using hand trowels and wooden floats to level and smooth surface. lays asphalt for roads; rakes asphalt, which has been ground and heated in furnace, level over concrete base, consolidates by use of rammer, and finally irons to solidity with long handled hot irons. mixes and lays cement, with trowel and float, in various parts of ship, such as galley, forepeak, floorings, bilges, etc. ; sometimes done by mason (572) (q.v.). spreads concrete on road, floor or foundation of building, and levels it with shovel to obtain correct level; makes small pillars, or "spots," of concrete here and there, and lays a long rule, "straight edge," or a long spirit level between spot and spot; where slight curve, or "camber," is required, uses a "camber" slip, a curved rule; sometimes done by navvy (581) (q.v.). (ii) is one of a gang who operate and feed a concrete mixing machine, shovelling ingredients into container of machine in correct proportions, setting machine in motion and emptying the container after mixing, by turning it over. a concrete layer (q.v.) who spreads concrete, composed of granite chips, cement and water, on road, floor, pavement, etc. ; also smooths surface of granolithic/ concrete, after spreading, with a trowel; usually also makes own concrete by hand with a shovel. tips, pours, or shovels wet concrete, usually brought to him machine mixed, into wooden casings or moulds, temporarily erected round reinforcing-iron or steel rods and ties, where it is allowed to set. sets up a cord, held in position by pegs at intervals, to mark line to which he is to work; sometimes spreads concrete with a shovel to serve as bed to kerbstones; lays kerbstones on this bed; spreads cement, with trowel, on ends of kerbstones, for joints; pours liquid cement, "grout," into small hole left at top of joint to strengthen ! it; where necessary, e.g., curved footway, dresses kerbstone with hammer and chisels to make it fit its position. lays paving stones, flagstones, bricks, etc., in a bed of mortar or cement, taking care that joints are broken, i.e., not continuous, and that level is correct and uniform; uses spirit levels, rules and straight edges; drives flagstone, etc., down into bed with a heavy wooden hammer, mallet or rammer; joints flagstones, etc., with mortar or cement; sometimes trims flagstones, etc., received dressed, cf. street mason, to irregular shapes, as necessary. lays stone setts in concrete or mortar on previously prepared concrete bed; when not already trimmed and shaped, trims them, where necessary, to correct size and shape, to fit particular positions, with hammer and chisels; other operations as for pavior, street. spreads evenly with shovel or fork road metal (granite) and tar, thrown down from carts on road surface; also spreads topping of chips and tar to be rolled in. one of a gang who lay wood blocks to form roadway surface, chopping blocks with small hand choppers to finish-off gutters, etc., and pouring tar over blocks, after laying, to allow percolation through cracks. makes bottoms and ends of cells for electrolytic decomposition of salt, sets up framework of steel rods and wire in wooden mould or shuttering; mixes and pours in concrete; as for ferro-concretor. works with pavior (q.v.) and performs necessary finishing or dressing operations with hammer and chisels to flagstones, paving stones, etc., before they are laid by pavior. a sett or wood pavior (q.v.) 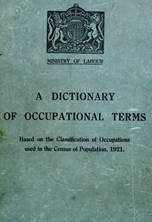 who repairs permanent way of tramways; sometimes done by tramway platelayer (577) (q.v. ).